Just when you thought it was safe to get ready for some New Voyages, a bit of Axanar or the long-anticipated Renegades, one more massive Star Trek fan project manages to slap you in the face and demands attention. 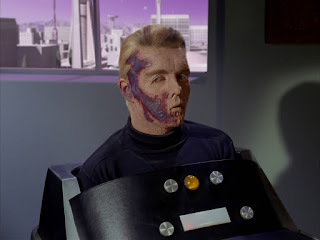 That's not a bad thing either since the project we're talking about is Captain Pike and unless you've been living with a Horta for the last few months, you'll already be aware that it could be the next Big Thing as far as fan productions go. The brains behind the operation is writer/director/producer Todd Shawn through his production company, Rigel VII (wonder where that name came from...?!) and I have to say, the scope looks mouth-wateringly good - even CG legend Tobias Richter is on board! "I came up with the idea because it was something I wanted to see." said producer/writer Todd Shawn. "We never saw him [Pike] in The Original Series. We saw The Cage and that the mission [to Rigel] was something that affected him but we never got a chance to really explore that character. "I thought that at some point in The Original Series they would go back and show something with him, maybe a flashback but we didn't. I can see from our Facebook page and the Kickstarter campaign that I'm not the only person who thought this way and people really wanted to see more Pike, see his history and when he first takes command of the Enterprise. "Everybody wanted to know more about Pike and there really has never been anything in film explored about this man's story or who he was, the missions he went on, the people he encountered and how he paved the way for Captain Kirk." Walter Doty, a good friend of Todd has been helping to bring the characters and story to life through the script; "I came up with the story and knew Walter was a writer and asked him to take a look at it." continued Todd, "We came up with something great and once we got the script out to the actors they were hooked and really liked where the story was going. They thought it was original and loved the whole feel of the film. They felt it was original that had not been done and that was important to me." For us fans that cast alone is dynamite with some major heavyweights on board. For starters there are former Star Trek main cast actors Robert Picardo and Linda Park from Voyager and Enterprise respectively. Add in there recurring Star Trek guests Dwight "Barclay" Schultz and Chase "Leeta" Masterson and you can already start to see the heights that this production is aiming for. But then there's even more to come with Ray Wise (Arturis from Hope and Fear), Bruce Davison (Jareth in Voyager's Remember and Menos in Enterprise's The Seventh), Sean Kenney (Lieutenant DePaul and the scarred Captain Pike in The Original Series) and finally Jorge Pallo (from The Secret Life of the American Teenager, Sons of Anarchy and many more) all taking up roles onscreen. But how do you get such names to sign up to your Star Trek project? "It comes down to the script." noted Todd, "One person gives it to another if they like it and so on. I've already worked with Ray Wise and showed him the script. If one actor has connections with another actor who then gives it to another or mentions someone who could be involved it goes from there." "It also helps if they are interested and it excites them!" added Walter with the pair also revealing that seven months work went into the script before they campaign to make the pilot even came into existence. In relation to the vision of Captain Pike, Todd has very specific ideas on where his production will be heading; "We're not doing a reboot as far as the new movies we will be much more based on The Original Series ideas. We're just doing it in a different look and a different tone. It will be a darker tone and something that has more of an edgy feel than you saw so it won't be the same music, the same lighting. "It won't be a duplicate of The Original Series because there are so many series that do that now and do it well. We don't want to copy that we want to do something new and exciting that people haven't seen before. That story is the one we only saw and heard glimpses of during The Cage and would flesh out the back story of the Enterprise's second commanding officer - but before that, the production team want to show fans and backers what they can do with the 45 minute pilot that will take us even further back into Star Trek history and the first time Captain Pike took command of the USS Enterprise. This pilot will introduce both Pike and Spock, see start of their friendship; their differences as well as show a younger Spock coming to terms with his emotional side. This Spock is less experienced, less confident and not the First Officer. The Captain Pike writers will be illustrating how he's trying to fit in and find his place in Starfleet especially as he's the first Vulcan to join the ranks. 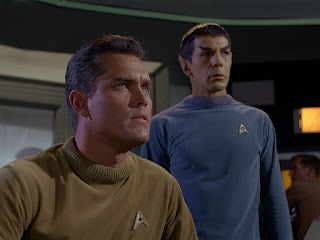 Said Walter; "You think of Kirk and Spock being so close but yet Spock was willing to go against Kirk and the Federation to help Captain Pike (in The Menagerie) by putting his career and his life on the line but yet we didn't know anything about this guy. Why would you be that loyal to someone? There has to be a reason. 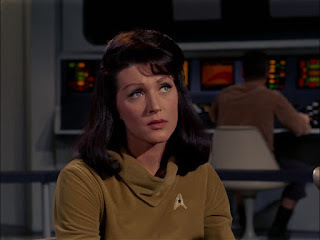 He has to be a very strong character in your life if you're willing to betray Kirk....As a fan of Mr Spock a lot of people want to know why he made these emotional choices, who he was and his relationship to Kirk and the Enterprise." "You'll also get to see Number One who is a very strong female officer and first officer. We get a chance to explore her character and who she is. We'll get to meet a lot of new and established crewmembers in the pilot and to explore some of the captains we met in The Original Series and find out what they've done and who they were. We will address that." To the sets and costumes, everything will be as seen in the original pilot so expect the gold and blue velour as well as some amazing finishing touches. For example, the patches on the uniforms are all being custom-made. Captain Pike will also be making use of the Phase II bridge set thanks to show executive producer James Cawley. James has also said they will help to redress the sets to replicate The Cage with black railings and silver doors which will help provide that feel of the earlier era. While they will be utilising the standing sets from Phase II, the episode is also set to feature an away mission and a space battle providing a fair bit of variety and making sure not everything happens within the confines of the USS Enterprise. 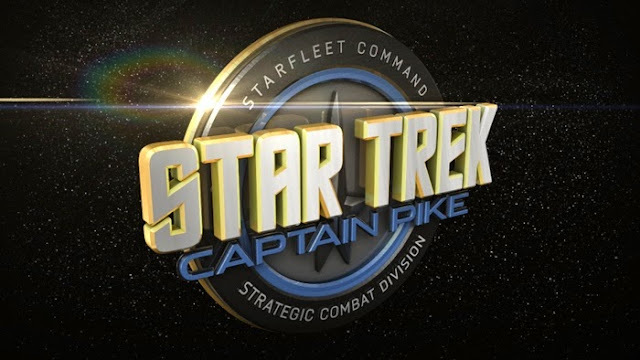 If the campaign to get this 45 minute episode is successful then we can expect a lot more from the team as they are writing a Captain Pike saga which goes well beyond their pilot and has the involvement of Walter Koenig. 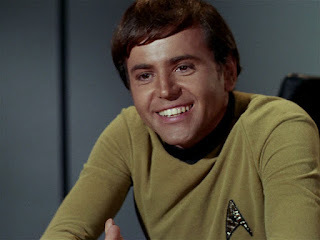 The Chekov actor was impressed with the project, coming in to both write and also play a unique role in the film. However, all these plans could be totally scuppered if the Kickstarter target isn't met and time is rapidly evaporating. So far over 500 fans have donated but of the $112,000 target only around $62,000 has been raised. If funding isn't reached there will be no production. "We really need people to help and give as much as can or even if they can only give a little to give that." explained Todd, "If you can't give anything please tweet and share the project because that doesn't cost anything but time and if you can help in any way you will get to see an epic film. If we get the funding we'll be filming in September, produce a teaser by Thanksgiving, a trailer by Christmas and then work on everything from the music to effects after that but we can't do anything without the funding." Remember that if you don't hit your target with Kickstarter you get nothing and if that's the case it would be back to square one almost for Todd. "We'd be looking at promoting at conventions, trying to keep everyone involved and do another Kickstarter to get funding in the future but we have the opportunity to do it now and if people want it, please support us any way you can. We've had a lot of support and we can't thank everyone enough for their help." Perks for the campaign are in four tiers ranging from $10 to $130 and offering everything from your name on the donors' page of the website through to PDF scripts, ship patches, exclusive making-of downloads and even specially produced clothing items as well as blu-ray copies of the completed movie. So now is definitely time to get behind this production. The players are available, the script is done - now all that needs to happen is for filming to begin and it's us, the fans who can make that a reality. Want to continue the discussion on your favourite social media platform? A couple of months might have slipped past since First Contact Day 2015 but there's no moss gathering for the organisers as they're already making a big impact with plans for the 2016 event. From my perspective it was a brilliant event which we now know will be back in 2016. Just to wrap everything up, I grabbed some time for a chat with Wil Ross and David Limburg one more time to get their thoughts on the 2015 event. "It was absolutely fantastic," recalled David, "One thing springs to mind [as a highlight] was the anti-bullying talk and it was amazing that Laura came forward to talk about it. We had such an amazing response from people to that. [They were saying] no-one's ever done anything like that before at an event and we really think it's an amazing thing you've done to come forward and talk about it and involve us in your experiences and what you intend to do about it. "The guests were wonderful, Garrett was incredible and the auction was great. We raised a fortune for charity and that says something for such a small event. Thank you to everyone for their contributions." Wil echoed David's thoughts; "It was great to see everyone and how much fun they were having. It was a completely crazy weekend. So much going on and we had to make some last minute changes but no-one seemed bothered. The only thing they were interested in was having a good time. "There are always going to be issues, things that throw you but aside from a few minor hiccups everyone have such good fun and the fact they're still going on about it today just speaks volumes and is more than we could have asked for." The gents are still waiting for confirmation of their world record for the biggest single gathering of Redshirts which topped out at just over 100. "They [Guinness] have everyone's names, copies of the certificates we printed and we're just waiting for the photo file," explained Wil, "Then we can get confirmation." 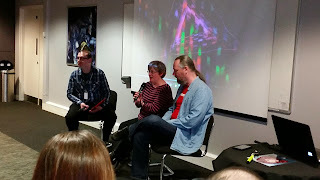 For myself Una McCormack and James Swallow's talk, compared by Michael Clark from Visionary Trek was fantastic as was Garrett Wang's session later in the day. For 2016 there will be a different, as yet to be confirmed, venue. But what else can we expect? Is there anything they'll be taking into that event from 2015? In fact the team are already getting emails asking what they're planning and has really stunned Wil and David. "Everything worked for 2015," said David, "There wasn't anything that we won't be doing next year. Everything we did is being repeated and being talked about and being compared to other events. In fact we're being compared to some of the much larger events and if we could do stuff why can't they do it?" "In taking it forward we just want to do more and the first thing that will be notable will be more guests and therefore a bigger venue. That's an immediate thing going forward." Wil woke up on the Sunday morning to be faced with some issues around the previous night's catering which was out of the organisers' control; "Now we have something in place with a different venue we are going to do food which will be more cocktails and canapes." The issues with the catering were one of the issues that mean that First Contact Day will not be returning to its venue of the last two years - and it also means that the event will be across two venues with the evening festivities taking place at a hotel because the team want to ensure they are set up properly for the day and for the Admirals' Party (keeping with the 50 years of Star Trek theme) which couldn't happen effectively otherwise. 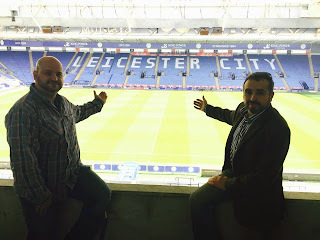 While I was putting this piece together further progress meant that the venue for the event is now confirmed as Leicester City Football Club. This keeps First Contact Day in the city and offers the organisers a lot more opportunity. 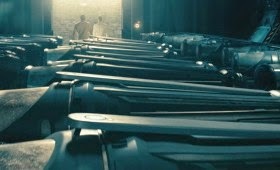 "There will be more guests," reaffirmed Wil, "It has been mentioned to us about quality rather than quantity, well we have quality and it will blow peoples' minds. There are a few "i"'s to dot and "t"'s to cross but we're there or thereabouts. James (Swallow) and Una (McCormack) want to come back and everyone loved them. Alan (Flyng) is also checking his diary." 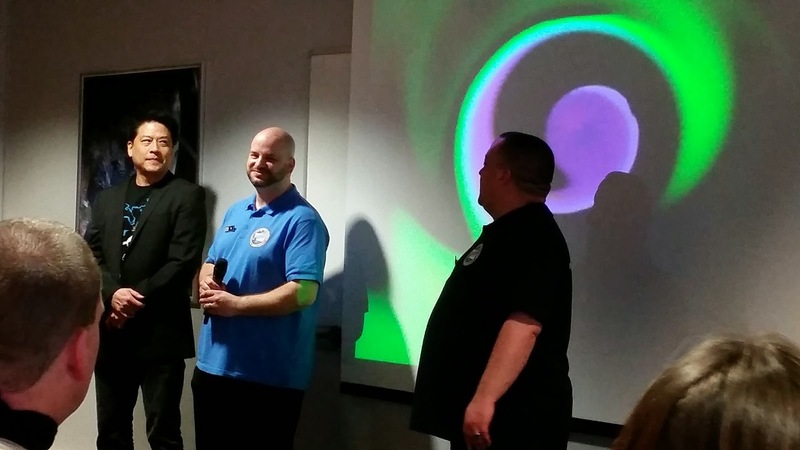 Having good feedback and all the guests from the 2015 event wanting to return is a sign that the team hit the mark with the two day meet at the Leicester Space Centre. Just from an observational point of view it seemed that everyone - both guests and attendees loved every second and I would think a lot of those who travelled to be part of it will be coming back next year. In relation to guests, those who attended will remember that Babylon 5 actress Claudia Christian had to cut short her appearance due to unforeseen circumstances. However, David has said that anyone who attended the event and did not get her autograph can contact FCD Events to see about receiving one for a minor donation to the C3 charity supported by Claudia. Across the two days there were around 900 people who attended the First Contact Day event in Leicester and the team is gearing up for 2016 to be bigger and better. With the names yet to be announced as guests it's more than likely going to top those numbers. Thoughts for what could happen additionally in 2016 to the already superb event of 2015 has thrown up possibilities of an Attack Wing competition (which was up for this year but had to be abandoned due to a lack of space) and also a retro gaming area. "We have some good contacts who can supply gaming equipment and as many consoles as we want," explained Wil, "I think that would be cool but the big thing to keep with the theme of FCD celebrating Star Trek is to get a replica bridge set." This is more likely to be an Enterprise bridge from The Original Series rather than The Next Generation with a photo opportunity to be a lot less than was being charged at other events in 2015. 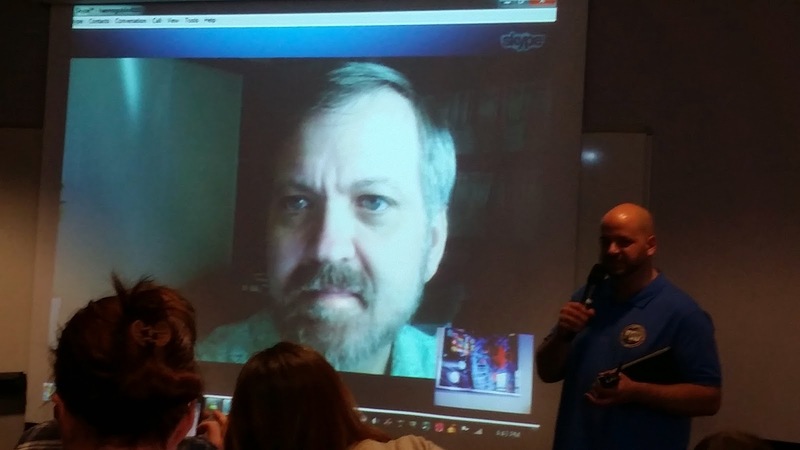 What we can confirm that has already been announced is that Larry Nemecek will be in attendance next year which is a big leap from his Skype appearance this year and Garrett Wang, Voyager's Harry Kim will be acting as MC for the whole weekend. 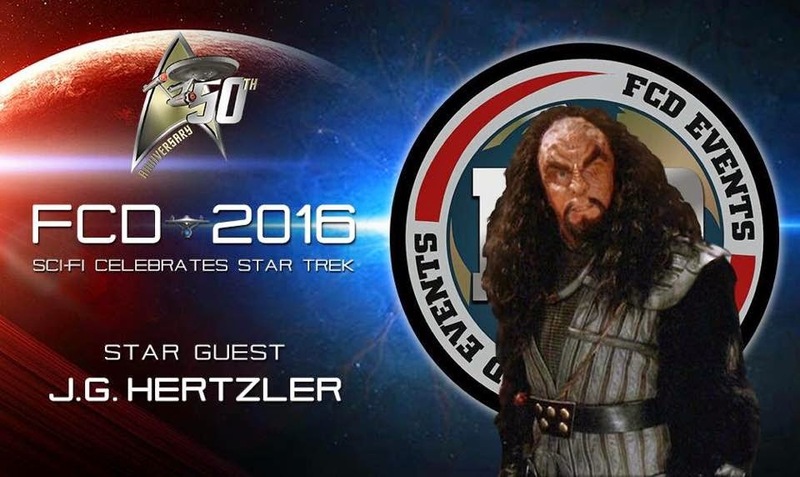 Oh and if that wasn't enough did you all spot the out-of-this-world news that the UK will be getting a visit from the Klingon High Chancellor himself? If you're interested in the raffle it's £2 per ticket and you can take a look at the great prizes on offer by following this Facebook story link right now as it's been extended due to demand. It's for an excellent cause and with nearly £1,100 raised, the team are looking to smash £1,200 very soon. Help them do it!!! It also seems that next year we'll be manning our own table so you can come and talk Star Trek and help us put together some video materials for the weekend. There might be some other bits we're thinking about but there's a year to go yet! Add into that the generosity of the team from First Contact Day that we will also be given the chance to make one announcement about next year's event before you'll see it anywhere else!!! Ticket prices will be announced shortly and we'll continue to provide updates on the event as and when we find out more details. Thanks also to Wil Ross and David Limburg for their time. 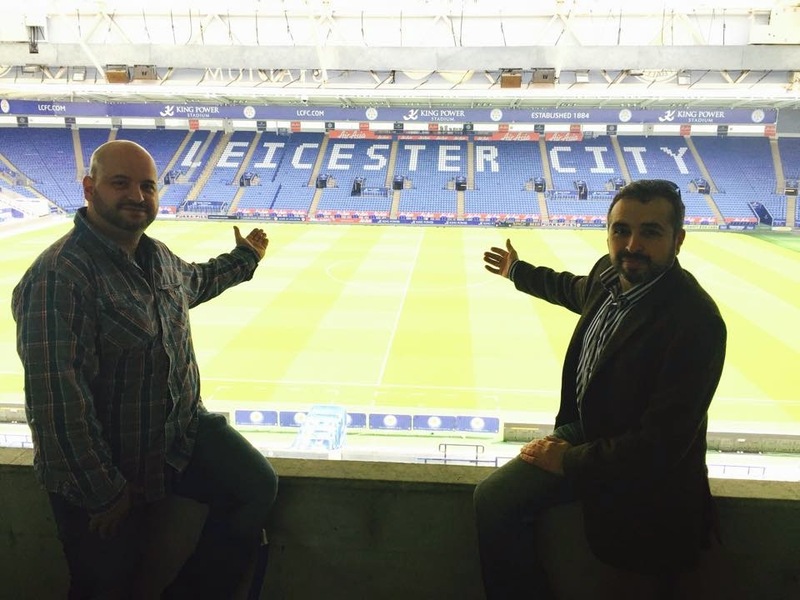 Looking forward to FCD 2016? Who do you think should be on the guest list or what activities would you like to see included? Why not suggest it here! 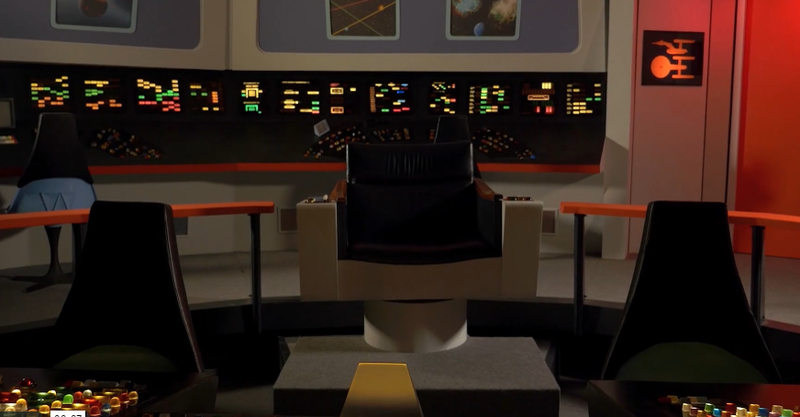 What does the last 50 years of Star Trek mean to you? A new and rather good documentary from Chris Tevebaugh goes some way to examining that very question with input from names including Larry Nemecek and Star Trek Continues' Vic Mignogna and Todd Haberkorn. Said Chris, "From concept, to shoot, to edit it was about six months [work]. My team put this documentary together as a passion project; we’re young people just getting into the film world. Clocking at ten and a bit minutes, SKoST was given a sneak peak shortly before the release with still some minor touchups to be made but that in no way detracted from the fine work we got to see. Our Star Trek: The Fifty Year Mission has real heart and sense of true nostalgia. Utilising the sets for Star Trek Continues adds a wonderful retro feel to the whole piece and reflects back on the franchise origins. The project was put together through the solid efforts of the team while all were juggling other jobs, meaning production time was purely voluntary during it's six month evolution period. 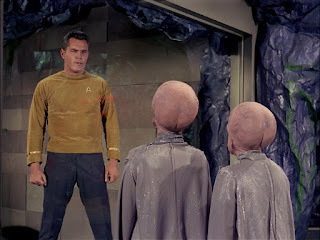 Explained Chris Tevebaugh; "I had always wanted to do a Star Trek something, but I never said it out loud; I didn't think anyone else would be interested. 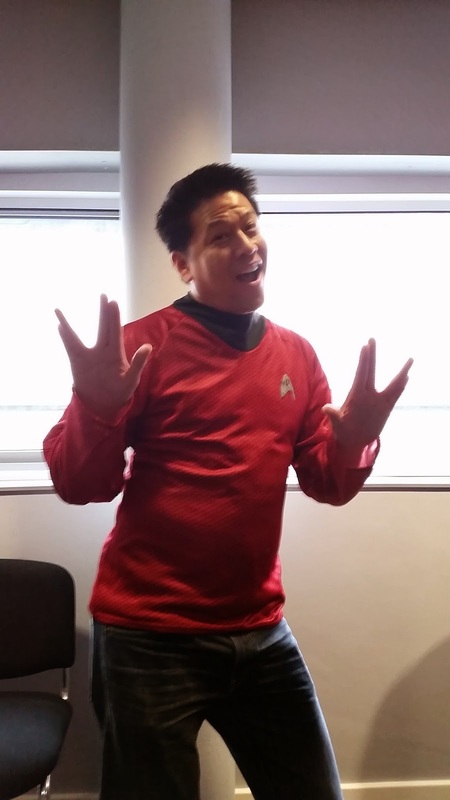 But after getting turned down for a grant to do a really awesome shoot my producer Erik Lee suggested we do a documentary… about Star Trek! Uh, yeah?! 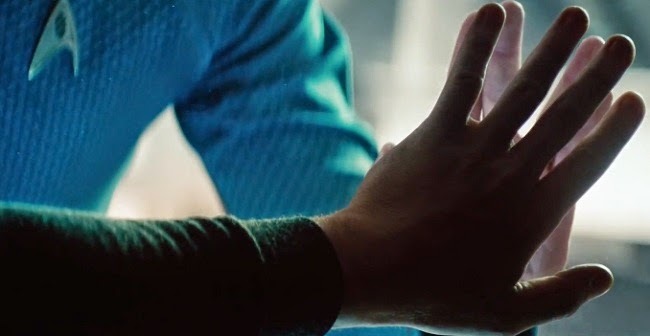 We both just wanted to dive deeper into the Star Trek world, to talk to our heroes, to actually be there. It’s the same thing that a lot of fans want, but we happened to be film-makers so we invented ourselves a way onboard the Enterprise." Speaking with Mignogna, Haberkorn as well as Chuck Huber (McCoy) and selected crew from the show, reveals the thoughts behind the Continues vision and what the team hope to achieve as well as how they are attempting to preserve the pioneering spirit of The Original Series. Their work is incredibly precise, thoughful and that attention to detail can clearly be seen as coming from the heart. It's not a cheap adventure either with the inclusion of "professional crew members and professional actors" which has certainly been true of the first three episodes released and once more emphasises the hard work given to regularly producing top quality new Star Trek. "We shot during the last few days of the fourth episode." 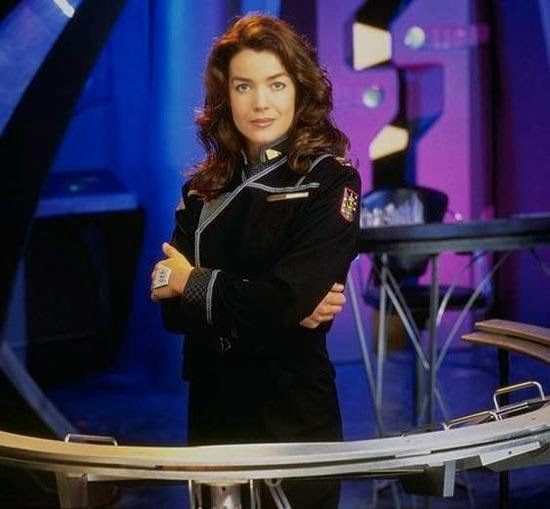 recalled Chris, "The Star Trek Continues filming schedule is kept under wraps so when planning the documentary we had no idea how little time we would end up having to get ready and shoot. After our initial conversation with the producers in November we learned that Continues would shoot in six weeks, so we scurried to get a Kickstarter going even though the concept for the film was still evolving. "The Kickstarter didn't end until the shooting of Continues episode four was almost complete. We raced down to the sets with a few days left and put the movie together in what was one giant two-month heart attack." I can definitely say that the near-coronary experience was well worth it(!) as the time flies by. What really strikes me about this great (if not short) piece of film-making is how tight the editing is and how insightful those conversations with the cast and crew from Continues is around their involvement with the series. The continuation of the franchise through motivated groups of fans is key and Tenebaugh has given a small window into one very successful team who are flying the flag with all their might and succeeding as well as uncovering the moments which motivate them to go that bit further. Inter-cut with memories from the Continues cast and crew, we get to find out classic moments and what made them so for different people. Those key scenes are remembered word for word and their effect is clear in the faces of those who are recalling them. It does make this a very personal journey even running at just ten minutes. 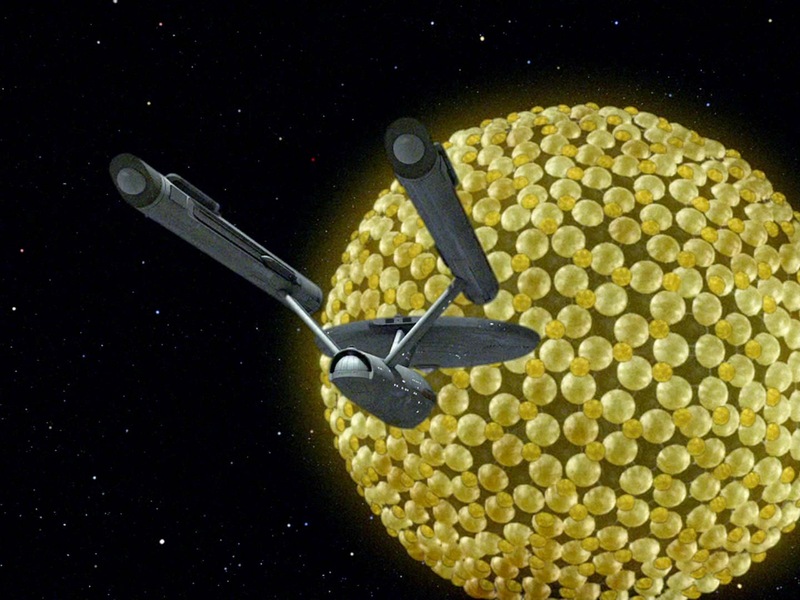 Certainly I found myself reminded of the Great Bird's vision and what Star Trek was designed to be about and in turn that made me think just how the Abrams movies have/haven't achieved that. Will fans of those films then want to explore the franchise further if they discovered that The Original Series was so markedly different? I did find myself pondering that question as I surfed the waves of nostalgia. "My team and I are very proud of the final movie." said Chris, "When making a movie, and particularly one with a nearly non-existent budget, things change and evolve. Film-making is problem solving at its heart and so the final project is not even close to any of the original concepts that were pitched. 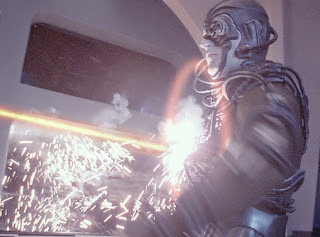 Considering what we found when we got to the Enterprise set, the movie we made is 100% the movie that needed to happen." 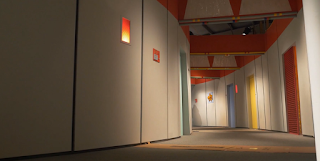 Chris and the team are already receiving some great, useful feedback on early versions of their work which is showing that their plan for Our Star Trek was on point; "My team is very good at setting the bar high for ourselves. They always exceed my expectations and this project is showing that. The Star Trek community has really been gravitating to the message. I think it’s an important time to be a Trekkie, a lot is going on right now. "The new movie is looming, rumors are constantly popping up about a new canon show, the fiftieth anniversary is coming up next year and fan films are hitting a real stride. It’s a good time to remind ourselves about the core of what Star Trek is, and who better to do that than the people who understand it best. So what's in store for Chris now that the work is complete and out there for all to see? Is there a chance we might get to see some more Star Trek productions in the future after such a promising documentary? "I think I go about my movies the same way Star Trek goes about an episode. I ask myself what needs to be said or thought about and I follow that story. At the moment I’m in pre-production on a non-related short comedy about Halloween. After Candy Corn is done I’d like to see if another episode of Star Trek Continues is in the works. "I’d love to do a more specific documentary about their filming script and ask the kind of detailed questions that never get asked. It’s an idea I’ll reassess at some point. I’m also curious what Star Trek fans want to know; I’d love for people to send me deep/dumb questions, things you’re usually not allowed to ask. "The great thing is I don’t have to answer to a studio, so I can ask harder questions. Comments about a next doc or anything else can be made on the movie’s Vimeo page." Whether you're a fan of Kirk, Spock or McCoy, the reminiscences here are well documented, precisely edited and well-presented and you get Vic Mignogna performing his very, very best Shatner. I just wish there were another ten minutes because it does feel over before it's really begun. Should they ever decide to do another or a sequel or anything, I'll be watching. What are your thoughts on Our Star Trek? Why not let us and the documentary team know here?! Ahhhh 1994 and 2001 are marked in your calendars aren't they? That's because today, May 23rd, marks both the airing of The Next Generation's All Good Things... and Voyager's Endgame. If you're working out the passing of time it's 21 and 14 years respectively. My my, how time has flown and only a few weeks ago we were raising the flag to Enterprise's flawed finale episode These are the Voyages. 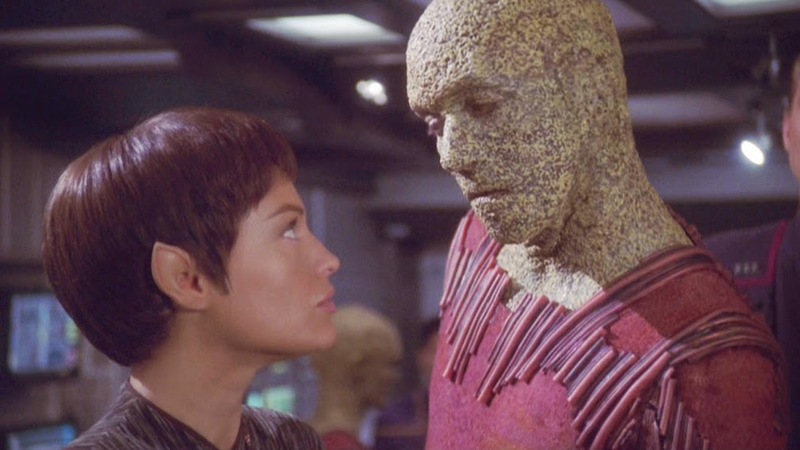 I'm a big admirer of All Good Things... and I'll be getting to Endgame in a few months time to close my Voyager rewatch (for those keeping track I'm hitting mid-season four and the magnificence of the Hirogen). The Voyager finale may not be the epic that The Next Generation managed but it still manages to bring the crew home even if that's only just as the titles roll. They also defeat the Borg which is nice. 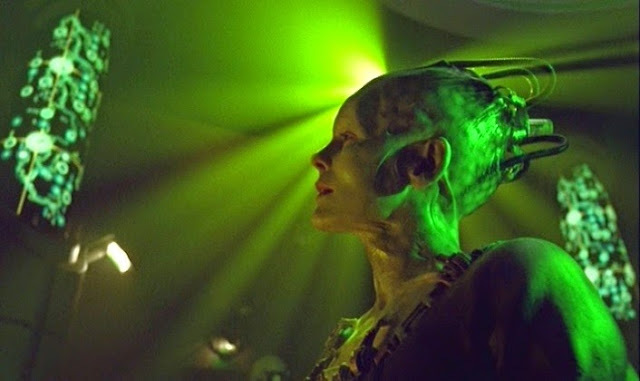 I suspect that when I do reach Endgame I'm going to find it a lot more fulfilling and satisfying given the way I have chosen to revisit Voyager this year. I have some good memories of watching it on VHS as I had with All Good Things... and What You Leave Behind previously. 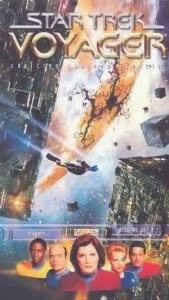 Janeway did of course appear once more after the finale in Nemesis from 2003 and the saga of that little ship still rolls on today in the novel series currently under the guidance of Kristen Beyer with Atonement only a few months away. 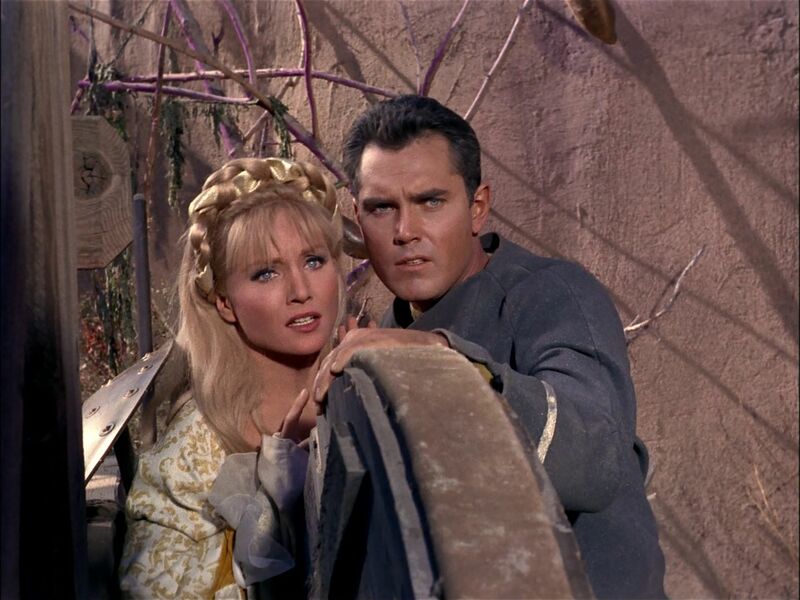 Those two points marked closure on the TV exploits of two of Star Trek's three seven-season adventures and here we are now in some form of Star Trek renaissance perhaps. There are a ton of superb fan-made web-series which are at such a high level of production you;d be forgiven for thinking they were the "real" thing from a CBS studio and the convention circuit is still rampant for the cast and anyone associated with the franchise. There's always that shadow and it's Star Trek Beyond. I'm not making any earth-shattering announcements here about the title, the director or whom might be playing a baddie or a Klingon but I do want to discuss the writer. 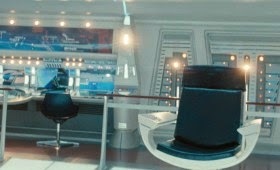 Simon Pegg we know is on scribbling duty. No big secret and nor is the story over his opinions on current "nerd culture" or on how the script for Star Trek 3 is coming along but the worry we thought might have faded away with his involvement have come back but I don't think it's Pegg's fault at all. From what I can understand Paramount want Star Trek to remain mainstream and steer clear of heading into the fan niche that might have accounted for its TV and cinematic demise in the early 2000's. JJ Abrams first two blockbusters proved that Star Trek could appeal to the larger non-Star Trek audience and retain the fan base and give us a blow-out action adventure in the space of about two hours. In fact we now know that Beyond will be less Star Trek-y because Paramount want to keep it earning big bucks and bridge the billion dollar gap between it and The Avengers which is the third biggest movie of all time. Seriously? That's a big mountain for Pegg and co to even attempt to climb and while a third outing penned by his hand will have more draw for fans of his writing, I just can't see the movie making that big a dent on the profits of such a movie mammoth. I truly fear that making it less Trek-y will take us even further down the path which was prodded and exposed to some degree in Into Darkness. There was more action and adventure, more disregard to the franchise history and exceptionally liberal mining of the script from The Wrath of Khan. 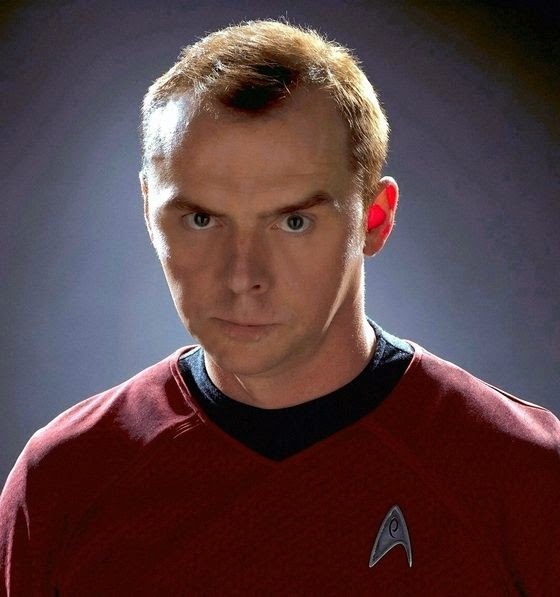 Now I don't believe Pegg will homage-slaughter Beyond and if there are nods they will be better handled but are we expecting too much and is the studio asking too much? Probably yes. Not only does Simon Pegg need to write something which mends the bad feeling of Khan and his super-blood but he has to avoid making Star Trek into something recognisable. Ok that means no technobabble, more space battles, probably a bit of lens-flare for good measure but will it still carry the moral themes and nuances that made the series what it was 50 years ago? Let's also remember that it will be arriving six months after JJ Abrams himself has directed a certain other sci-fi blockbuster sequel called The Force Awakens which lands in December 2015. Justin Lin will have to direct like he's never directed before as his work will be compared whether he likes it or not to Abrams Episode VII. I don't think the third Star Trek reboot movie will be the last but it will have to prove its worth. I don't expect it to please a lot of fans because the dollar signs are king and nor can we expect it to lead into a TV series (stopping right there on that point). Frankly who cares what SImon Pegg believes about today's sci-fi fans? Heck, Scotland Yard was checking us out before the Millennium in the UK in case we all went a bit nuts in 2000 and as long as he delivers a movie which he knows is the best he can do and is precisely what the studio have asked for then he can do no more. We've all had jobs where we haven't wanted to do X, Y or Z and his is no different. Pegg has a job to do or he won't get paid so our dissatisfaction needs to be aimed higher if Beyond is a turkey. I'm really looking forward to seeing his work begin to take form in trailers, set shots and rumours that will explode in a matter of months. We are now barely a year away from the premiere and (from what we know) not even a frame has been committed to film and that might be the biggest concern left - time. This film has to be released in 2016 to coincide with a teeny tiny anniversary but yet we are nowhere near. Flashback to Into Darkness and the 2009 movie and we were well into production by this time. Is now our ultimate fear about Beyond that whether the script is good, bad or just ok it could be slapdash to produce "something" by June next year. So let's see this as the "official" start to our countdown. I expect whatever result we get will be a big winner at the box office. Looking forward with anticipation to the new movie or really concerned we're going to get a garbled mess? Let's talk! 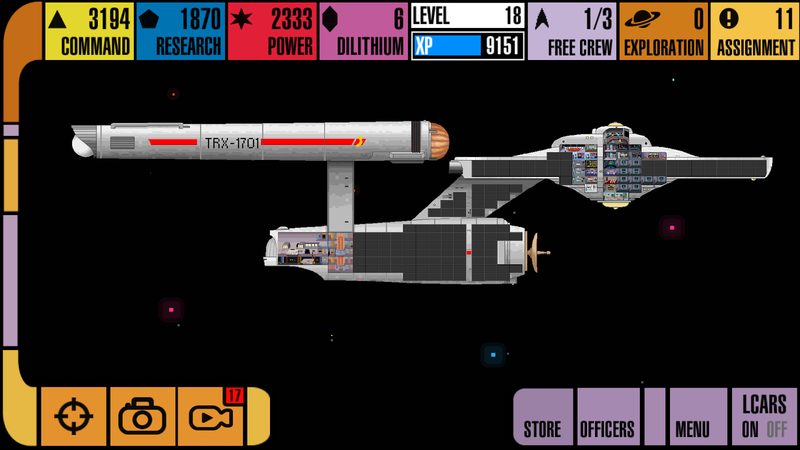 Purely by chance I stumbled across the latest Star Trek addition to the Google Play store. Now all you iOS users will be mocking me at this point because you've had the chance to play Star Trek Trexels for some time however us "lesser beings" now have the opportunity to join the fun and I am truly hooked after a couple of weeks. Whenever I download a new game from the app store I straight assume that it will have some type of in-game purchase requirement which will in turn mean that upgrades, changes and level ups might take a serious amount of time to take place because I won't part with a penny to progress further and quicker. Graphically, Trexels is 100% retro, taking us back to those Commodore and Atari graphics of the 1980's which is an immediate winner for me. Produced by CBS Interactive, x-cube Games and Yes Gnome, its just about the best Star Trek mobile game out there as far as standalone experiences go. I'm sure some will say that the recent Family Guy: The Quest for Stuff event was as good and if not better but that was a game within a game if you will. Up to now all us mobile gamers had was a few sound boards and a pretty poor tactical game that vanished from the Play store. 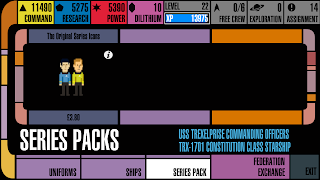 Opening up you get yourself a basic bridge crew, the USS Enterprise TRX-1701 and a lot of options to explore. 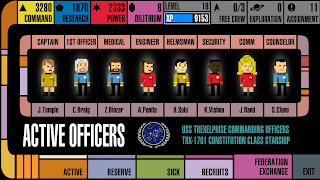 The menu screen is a mix of The Original Series and The Next Generation with your crew in classic uniforms on a classic bridge however the layout is set up around the LCARS elements from the later shows. Your starship has the basics when you acquire her; a bridge, turbolifts, a sickbay, main engineering and a shuttlebay but that's about it. This leaves a lot of expansion room to add crew quarters, holodecks, a Battle Bridge, security stations, Ten Forward, torpedo bays....the list is extensive and split across four areas of Operations, Personnel, Science and Security. As you level up there are more rooms available to build (and more space to build into) and upgrade but beware, you'll need the right amount of Command, Research and Power resources to create your dream starship. I'd recommend getting your Starfleet Academy in place quick and get training that basic crew up with haste. The rooms all have their own advantages and bonuses, meaning that selecting the right one and putting it in the right place can have benefits to surrounding features as well as away missions. Those valuable resources can be bought through the always available store or more satisfyingly come from getting your crew to work on the ship or through the missions which you can undertake across a range of star systems requiring different crew skills and away team set ups to complete. These missions are very cleverly done and give variety to the gameplay. 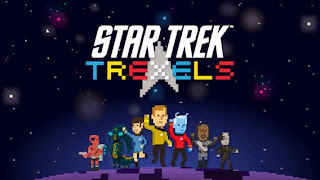 While Star Trek Online chooses the old point and click pew-pew style and the upcoming Star Trek Timelines has chosen a more "dice rolling" board game-esque experience, Trexels has gone a very different route. As each scene of the episode adventure takes place, you collect cubes of energy effectively for defence and attack purposes. Sometimes it's diplomatic, sometimes a battle or on occasions there's the chance to do some techie work and bring computer systems back on line. These encounters bring you into contact with some of the best villains from the Star Trek universe in all their pixellated glory including the Klingons and the Borg (massively out of canon but who cares). Yet, dear adventurer, be careful to balance your mission with receiving damage or your crew/away team will be lost. You'll need to get your crew trained up as well. It might seem a breeze at the beginning but as the exploration progresses it does become harder and crew skills become much more relevant. 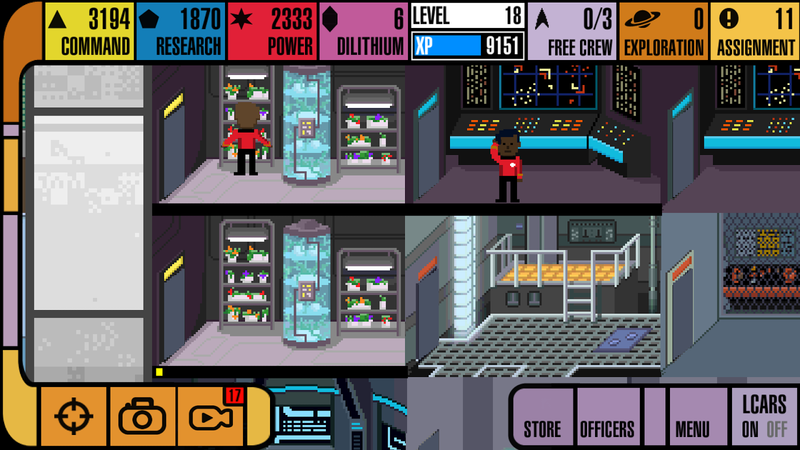 Of course there's the option to move ahead quickly by using dilithium to buy features ahead of their level unlocking or buy additional resources and even different uniforms for a nominal fee but I, as stated, have chosen the long haul as my wallet has a padlock on it. It is keeping me thoroughly entertained, ensuring that I have crew working in different areas of the ship (I only have three at the moment) to provide resource to then use to explore galaxies and build more aspects of the ship. The crew, as noted, can be trained up across a range of skills in your own, onboard Starfleet Academy as you go. Again it requires a substantial amount of resource so be prepared to keep on top of our shipboard activities to get those numbers up. Either that or slap some cash into the game store. Talking of crew, you do start out with a whole crew of no-names taking up the positions of everything from captain to engineer through to counsellor but there are more familiar faces to purchase. Shame here is that they are limited to the crews of The Original Series and The Next Generation with Picard costing a jaw-dropping 59 dilithium crystals - and they aren't that easy to come by. What you do get though are neat "guest stars" in the form of your favourite pixellated...erm...guest stars. 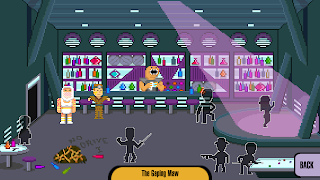 Classics from The Original Series such as Kang, Naked Time Sulu, Christine Chapel and Zephram Cochrane are all unlockable by completing various worlds through the game. For those who can't wait the scarce dilithium can be used to get them early. Some of these guests are still down as "Coming Soon" such as Wheelchair Pike and the Talosian which does indicate that there's expansion plans afoot for this gem of a game. Likewise you can upgrade from a retro Constitution Class to a budget Galaxy Class which increases firepower and tractor beam power only. This for me is a bit of an issue. Let me explain. 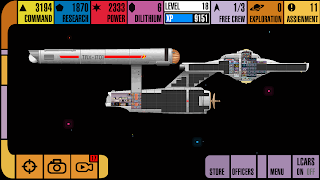 While I am totally addicted to this game so much even my three-year-old is playing it within a few days of downloading I'm holding out that the team behind this game will be adding in the crews of Deep Space Nine, Voyager and Enterprise at some point as well as further starships with their own quirks. 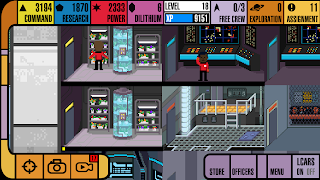 Not being able to select Sisko, Tuvok or Phlox does limit the game a bit but not to a point where it becomes boring in fact as I'm writing this my crew lounge is being built and I've got a few resources to collect. All in a day's work I suppose but I would like to have more variety in who I can have on my command crew and who I can sacrifice on an away mission. I've also experienced a couple of little bugs in the first few days) I've now been playing for about 10 days). 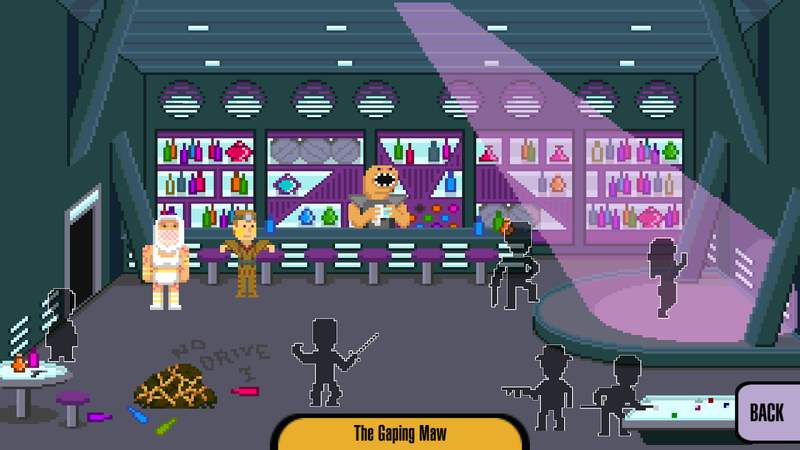 Occasionally I'll get double graphics overlay as if I'm playing two different areas of the game and it was impossible to unlock the holodeck feature by connecting Facebook and then like the Trexels page. I attempted this four times with zero success and finally chose to spend a bit of that valuable dilithium to get the room. On occasion I did find that Trexels wouldn't load until about the fourth attempt just after I'd unlocked Kirok. As I opened the second system it also required a serious amount of screen tapping to open up each world meaning I've now developed a very flat-ended index finger. 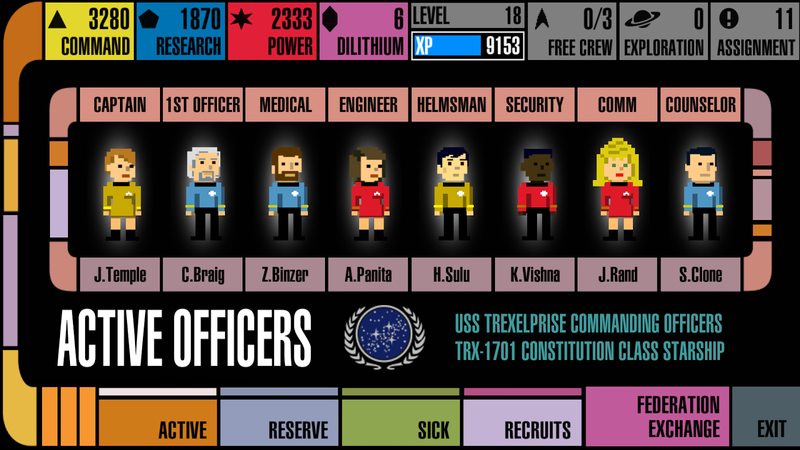 Minor quibbles there that will surely be sorted in the future and I'm sure that the Trexels team will happily refund my dilithium(!). Otherwise this is a great mobile game and well worth the wait. If you're an Android user like myself you'll probably have already snapped this up during the week and be playing it to death. While there's nothing overly technical about playing Trexels it does come down to being adept on managing your resources to complete the aspects of your missions. Buying additonal bits in this freemium world is nothing new so either be prepared to lose a few quid or develop your patience levels. The latter is cheaper. So here I am, over a week into playing and not yet edging towards boredom or the gnawing need to buy extras and speed my way along. I have drained some dilithium - mainly thanks to my son purchasing Janice Rand - and completed the first sector. This has given me the Horta and Kirok as guest stars but a shortage of room space ahead of entering the second sector. It's also an expensive wait since I need a lot of resource, command and power to open up the next set of worlds but I can wait. I think. Time is now being spent increasing the number of crew, upgrading rooms and pooling funds for the next step forward. 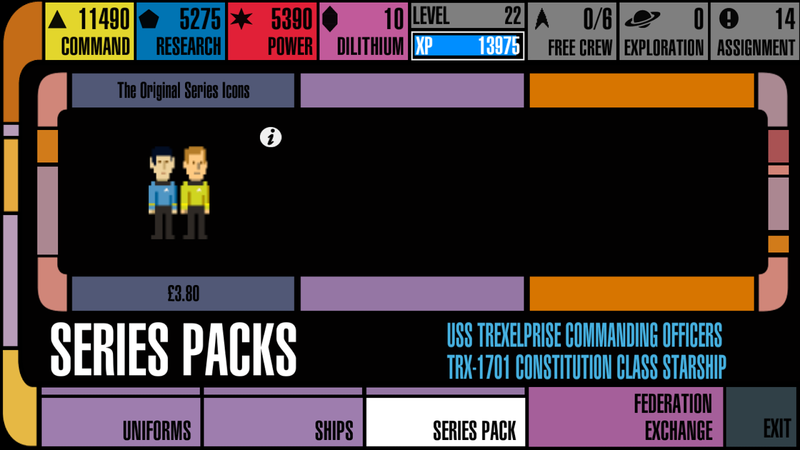 The creators have also provided a limited time offer to purchase a Kirk/Spock pack for the princely sum of £3.80. Available until the end of June it might just tempt me to spend a few coins but then that's probably the deadly spiral into buying dilithium for a Crew Lounge and an Observation Lounge. Probably against my better judgement. In conclusion with this one I am pleased although it's been a long, arduous wait and I know it will keep me going at least until Timelines drops in the not too distant future. The concept of the 8-bit graphics and simplistic gameplay works perfectly even if there is a mix of generations in the implementation. I'm now awaiting the next challenge which will hopefully mean I can get some more dilithium. I have no way to compare this to the release on iOS so if you are aware of differences and upgrades that aren't available on Android, please let me know as it would be good to get that second opinion and to fill in the gaps. Are you playing Trexels? What are your thoughts so far? Star Trek Wars: It's Not the End? It could be decommissioning time for one of the greatest Star Trek podcasts to appear for some time. Star Trek Wars hosted by Jeremy Reed is now heading towards the midst of the second season of all five shows but personal circumstances could mean postponing the show or, even worse, cancellation. It's almost like certain events from the late 1960's around a certain popular science-fiction TV series isn't it...? The show was about to reach its 39th episode and would have been talking about the 16th installment from each show's second year including discussions on The Gamesters of Triskelion, Meld and the superlative Q Who but plans are currently on hold due to those recent circumstantial changes. 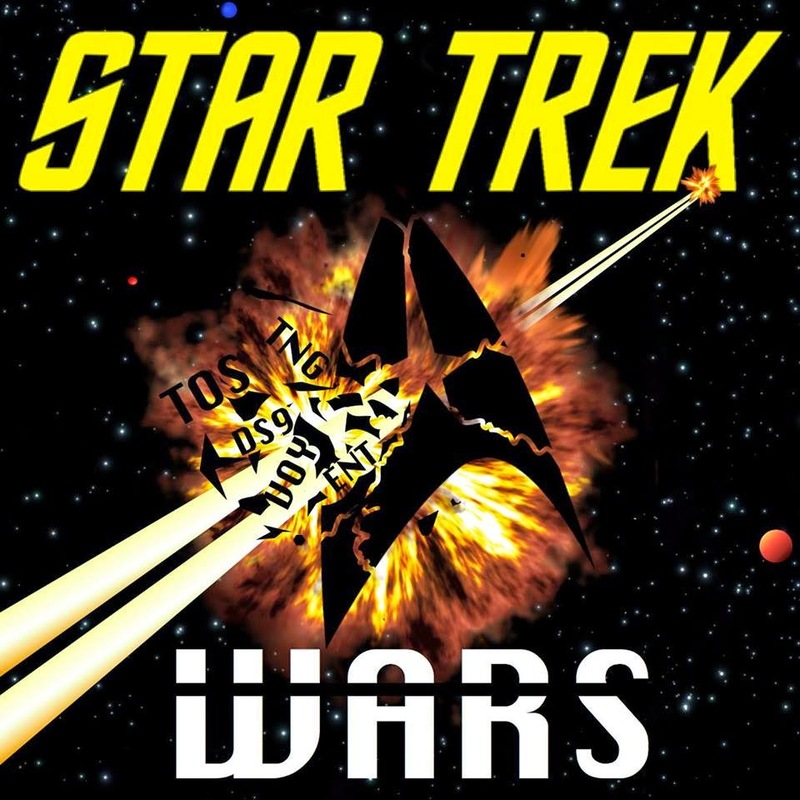 The fortnightly Star Trek Wars podcast is now pulling thousands of downloads per episode and has been making gradual improvements almost in the same way as Star Trek itself did during the 80's and 90's, meaning it's now beginning to really hit its stride. 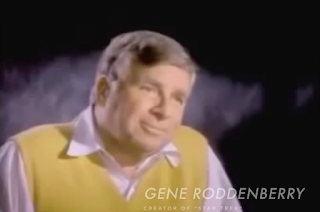 "The original concept of Star Trek Wars was to bring together people with very different Star Trek backgrounds," recalled host Jeremy, "to watch an episode from all five Star Trek live action series each week to discuss and determine which show was the best." It's definitely a different, unique format that has, at times, had me shouting out loud, agreeing wholeheartedly or even reassessing my opinions over episodes from the early years of each show. Only a select few episodes have managed to achieve a full score from the team over the last 38 episodes but I'll leave you to find out which. Star Trek Wars is the kind of podcast we fans need - one that encourages debate and does make you want to take part in the next episode. Which is an option as we'll see. "I have always taken constructive criticism to heart," said Jeremy, "Actively listening to what the community wants in this podcast. I feel the biggest improvements made were sitting down and creating a standardized structure for reviewing each episode. My favorite improvements actually just came in the last few episodes..."
Those improvements came in the arrival of new co-host Jordan Rosenwinkel and the inclusion of a listeners score (aka the Detepa Council) and comments piece within each episode which have meant the audience is being included much more in final score and in choosing the winner. 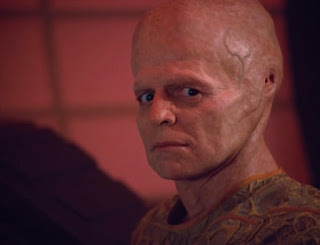 A great shame that it could all come to an end so soon and so suddenly when the show still has to break ground on the brilliant third seasons of The Next Generation and Deep Space Nine. It may look bleak for the podcast but Jeremy is managing to look at it in a positive way; "One of the main things I have learned while doing Star Trek Wars is just how much Star Trek can get you through even the darkest of times. It has also helped me gain some respect for some of the Star Trek's I didn't much care for when they aired all those years ago; Enterprise especially." "What is needed now to continue the mammoth project is a Macbook as Apple Macs come with the editing software I use (MIDI for multiple mics, Garageband for music creation and podcast editing, iDraw for episode artwork, etc..). The mics and audio recording equipment I still possess, it is just that Mac that is still required. "A gracious person reached out to me and shown me a place where I can acquire a Mac for a third of the normal cost (with their discount), so I have started a Go Fund Me campaign to raise the money needed to continue on at http://www.gofundme.com/StarTrekWars." Star Trek Wars had certainly evolved since they took up the challenge on the pilot episodes and the 37 weeks after that. Now the project is a mere $80 off its $300 target and there's still a good amount of time left to hit that figure to ensure the show's survival. I've become a big fan of the show and it's demise would be a great loss as I do feel it has a lot more to give. For those who remember, we did review an early episode of the show and even since then the style has developed, the discussion tighter, the fun facts more...fun and some of the early teething troubles have been long since banished to Ceti Alpha V.
Now all that stands between the show's survival is a few dollars and I would ask fans of Star Trek everywhere to grab a listen to one of the most recent episodes which can be found via their website and be sure to leave a review on iTunes if you can to help spread the word. If it floats your starship then I'd certainly recommend hitting up gofundme and helping keep this entertaining show on the air. Listened to Star Trek Wars? What other podcasts do you recommend or should get more coverage? Let us know below!! !